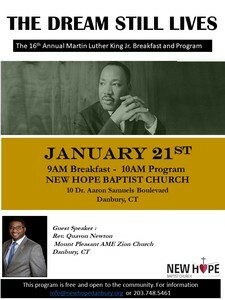 New Hope Baptist Church will host the 16th annual celebration of the life of Dr. King. The continental breakfast will start at 9 am and the program will begin at 10 am for those not attending the breakfast. Our guest speaker will be Rev. Quavon Newton and there will be performances by the DHS Jazz Band and other local youth choirs.